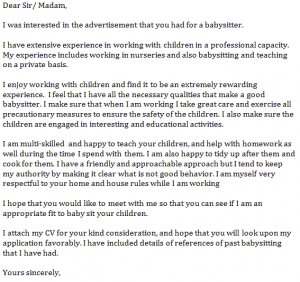 Babysitter cover letter example can be used for Babysitting job applications. Amend as suitable and use it for yourself. This letter sample is fully editable and free. Check our our other covering letter examples on Learnist.org. I was interested in the advertisement that you had for a babysitter. I have extensive experience in working with children in a professional capacity. My experience includes working in nurseries and also babysitting and teaching on a private basis. I enjoy working with children and find it to be an extremely rewarding experience. I feel that I have all the necessary qualities that make a good babysitter. I make sure that when I am working I take great care and exercise all precautionary measures to ensure the safety of the children. I also make sure the children are engaged in interesting and educational activities. 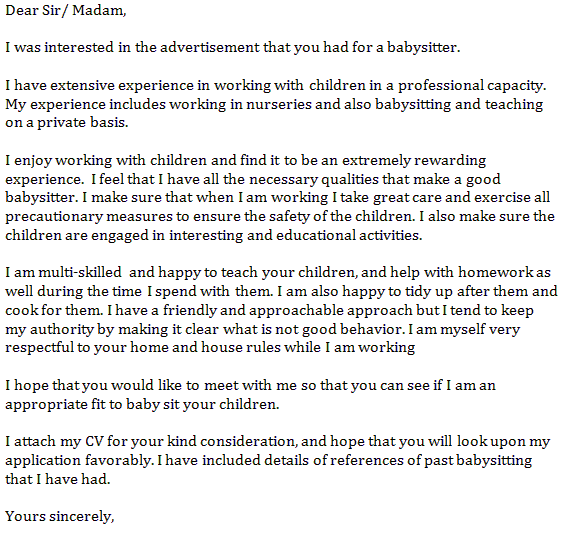 I hope that you would like to meet with me so that you can see if I am an appropriate fit to baby sit your children. I attach my CV for your kind consideration, and hope that you will look upon my application favorably. I have included details of references of past babysitting that I have had.